Putting up a decent show after a horrendous first 20 minutes, host India fall down 1-2 against Oman in a FIFA 2018 World Cup football qualifying match at the Kanteerava Stadium here on Thursday. Much before the 19000-plus spectators settled down on their seat, Oman took the lead from a powerful show from striker Qasin Said. The goal came as early as 21st second from kick-off was an outcome from poor defending. The goal left the defense in tatters. As many as three defenders in Rino Anto, Dhanachandra Singh, and Lalchhuan Mawia debuted for India today. Their lack of understanding between skipper Arnad Mondal looked evident. However, India was quick enough to equalize on a lapse from Oman defense. Vice-captain curled an outstanding left footer from the top corner of the box. That was a stunner from Namma Bengaluru FC player which left the opponent dumbfounded. Hosts gained confidence and started controlling the midfield. It was the Indian defense again gave away a penalty to their opponent when Dhanachandra brought down Eid Mohammed inside the box. Amad Al-Hosni gave Oman 2-1 lead. Post lemon break, India dished out a much improved performance, keeper Paul was seen hardy in any kind of trouble. They almost got the equalizer in the 69th minute via Robin Singh, when a variation in corner flummoxed Oman defense. However, South Korean referee ruled out the goal much to the displeasure of crowd. India is placed in Group D in the Asian group with Oman, Iran, Turkmenistan, and Guam. The matches will be played in home and away basis. 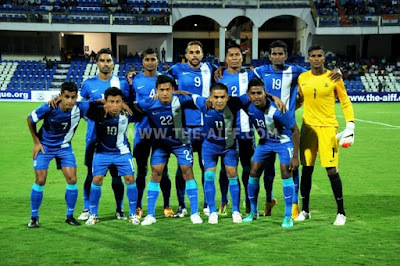 India will be travelling to Guam for their next match. The top two teams would advance to the next round.